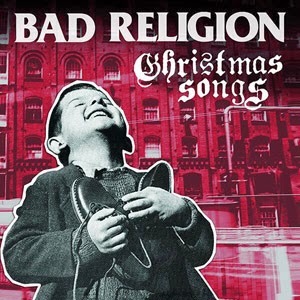 Whenever I go through a mental list of bands that I wished had made holiday music, punk rock veterans Bad Religion always always top that list. Okay, so that's a lie, but their new Christmas album, very cleverly titled Christmas Songs, has intrigued me ever since it was announced. The album turns out to be pretty much what you expect. Greg Graffin and company crank up the tempo and lay down buzzsaw guitars on all of your yuletide favorites. From the outset we're treated to blistering guitars that burn through classics such as "Hark! The Herald Angels Sing" and "O Come All Ye Faithful". "White Christmas" is given the "I Wanna Be Sedated" treatment with a bouncy driving beat. Not surprisingly, "Little Drummer Boy" pounds away on the skins. The lone whiff is "O Come, O Come Emmanuel". It's not one of my best-loved carols to begin with, but this rendition is particularly messy. The inclusion of a new mix of Recipe For Hate's "American Jesus" is a little odd as well. Christmas Songs probably won't be appropriate as a soundtrack to your Christmas dinner with grandma, but it is a fun ride for those of us a few decades younger. Best tracks: "O Come All Ye Faithful", "White Christmas"